A football manager has banned players from speaking to their local paper unless they bring in a new sports reporter. 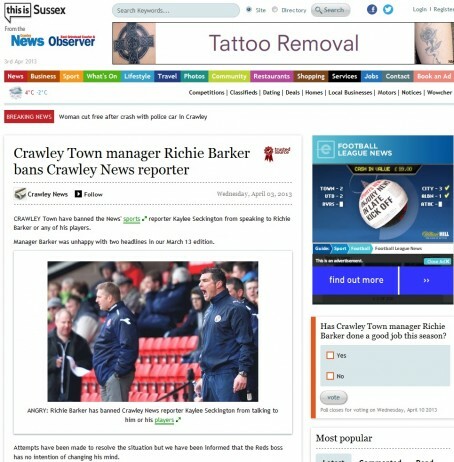 The Crawley News’ regional sports reporter, Kaylee Seckington, incurred the wrath of Crawley Town FC manager Richie Barker with two headlines in an edition last month. One story focused on another club being interested in one of his players, Sergio Torres, while the other was a piece about the agent for fellow player Charlie Wassmer revealing his client would not leave the club until his contract was paid up. Kaylee is still allowed to go to matches, but has been told she will not be allowed to attend post-match press conferences or call the manager or players for interviews. Editor Andy Worden said he had no intention of giving in to the manager’s demands. “No credible newspaper would shy away from covering such stories, which are, of course, of real interest to fans,” he said. “We would be failing in our duty as a newspaper and an employer if we did not stand by our reporter, who we feel has covered the club fairly and accurately at all times. “For many years, and many leagues below the club’s current position, we have given the club staunch support and thorough coverage. Other – rather more trivial – complaints included one revolving around a light-hearted Twitter remark revealing he was wearing trousers on the touchline, instead of his usual shorts. Andy said that Barker had raised the issue following the March 13 edition, and organised a meeting with him and Kaylee to discuss the matter. “Since the meeting we have gone to more effort than many papers would have to keep the club’s manager happy,” he added. The paper’s story about the ban can be read here. Nobody from Crawley Town FC was available for comment.